Sultan Bangla Movie 2018 By Jeet & Mim. Romantic, comedy and action mashala upcoming bangla movie Sultan. Sultan will be making under banner of Jaaz Multimedia and Jitz Films Workers. Actually Sultan is an Indo-Bangla joint-venture upcoming movie. Sultan Bangla Movie jointly directed by Raja Chanda and Abdu Aziz. Basically Indian part director popular Raja Chanda and Bangladesh Part director Jaaz Multimedia Chairman’s Abdul Aziz. A long time later Raja Chanda again making Sultan Bangla upcoming movie. Raja Chanda’s last released movie was Black starring by Soham Chakraborty and Dhallywood hot queen heroine Bidya Sinha Mim. Directed by: Raja Chanda & Abdul Aziz. Produced by: Jaaz Multimedia and Jitz Film Workers. Casting by: Jeet, Bidya Sinha Mim and Priyanka Sarkar. Sultan Bangla movie leading character playing by Tolly superstar Jeet and Bangladeshi Lux superstar Bidya Sinha Mim. By this movie both bengal will be gets a new paired. Sultan Bangla movie also starring Priyanka Sarkar.This movie director Raja Chanda and Abdul Aziz told us that we are very excited to this movie. Their chemistry will be enjoy Bangla movie lovers. Jeet is the big superstar of Tollywood film industry. Before he acted joint-venture Bangla movie. His joint- venture movie were Badsha-The Don, Boss 2 and upcoming movie is Sultan. His last released movie was Boss 2 with Subhasree Ganguly. Jeet’s notable movie are Shathi, Yuddho, Nater Guru, Awara, 100% Love, Boss, Oviman, Premi, Champion and more others. Bidya Sinha Mim now busy to her upcoming movie. Her upcoming movies are Pashan with Om, Mamla Hamla Jhamela with Shakib Khan and Sultan: The Saviour. At present time she not play any natok. She told us about her career. She know us that film is the most priority place at now to me. So i all thinking is to film. Sultan upcoming Kolkata Bangla movie shooting started date on next 23 February 2018. At now Bidya Sihna Mim stay on Kolkata for shooting first lot. First lot shooting will be going on next 28 February 2018. We got the news to Bidya Sinha Mim. Before going to Kolkata she told us about Sultan movie. She also said us that Jeet is powerful and good film actor. I saw him many movies such as Shati, Awara, Champion, Wanted, Yuddho etc. I think Sultan is added new era of my career. Upcoming Bangla movie Sultan movie shooting location are Kolkata, Thailand and Bangladesh. 23 February 2018 will be start first lot shooting. And 2nd lot shooting will be started on next March 2018. 2nd lot shooting location is Thailand and Bangladesh. 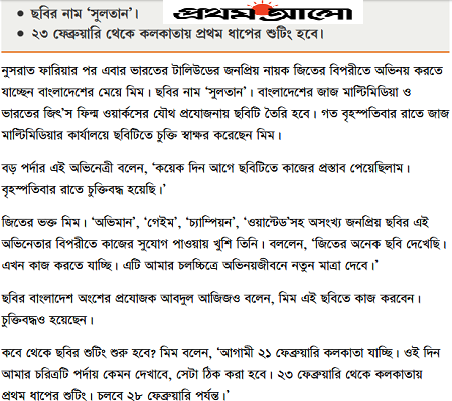 But third lot shooting information not announced that when will be held 3rd lot shooting of Sultan Bangla movie. When Release date of Sultan Bangla Movie 2018 By Jeet & Mim? 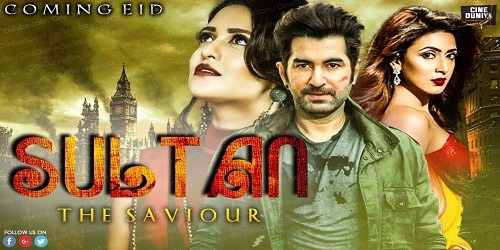 Sultan: The Saviour Bangla movie will be released in this year any one festival. We know the news by director of Abdul Aziz. He also know us that we are very excited to this movie. We expected by this movie Bangla film industry to be gets a popular paired. Dear visitors we are try to update news published here. If you wants to get regularly entertainment news such as Movie, Natok or Drama, movie trailer, movie reviews, movie release date, song release and all entertainment news etc. So lets to enjoy by update media news must be stay with us. So if the site likes then share to others. And best of luck upcoming Sultan Bangla Movie 2018 By Jeet & Mim.